DWW’s 2018 Writing Competition is now OPEN FOR SUBMISSIONS! Contact information is to be printed on an index card (name, address, email, phone, category, and title of each work submitted) and submitted with your entry/entries. Print the contest category and title of the work on the first page of each entry. Submit works only in the English language and use a 12 point serif font such as Times New Roman. $20.00 for up to three total entries, regardless of category. Once submitted, entry fees are not refundable. Winners will be announced at the DWW Writing Conference to be held on November 10, 2018, at the MSU Management Education Center in Troy. DWW reserves the right not to award a prize or prizes if enough entries are not received for a particular genre or the caliber of entries submitted is not strong enough to earn an award. Enter early! Our judges look forward to reading your work! 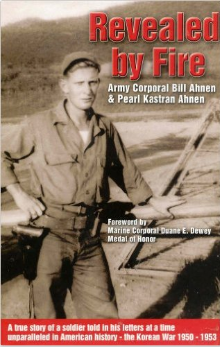 349 priceless, historical letters of the Korean War written by an ordinary soldier, Corporal Bill Ahnen, and published for the first time. Bill's letters show honesty, humor, compassion and reveal the heart of a very lonely, homesick young man.